This issue of NASET’s ADHD series was written by Renee B. Brown, Ed.S. and comes from the Fall 2013 edition of the Journal of the American Academy of Special Education Professionals (JAASEP). It reviews pertinent research, then uses a single-subject experimental design and methodology to assess the impact of both positive and negative interventions to reduce the incidence of inappropriate classroom behavior in a 12.2 year old male student with Attention Deficit Hyperactivity Disorder (ADHD). In the context of this study, inappropriate classroom behavior is defined as speaking out inappropriately in class. 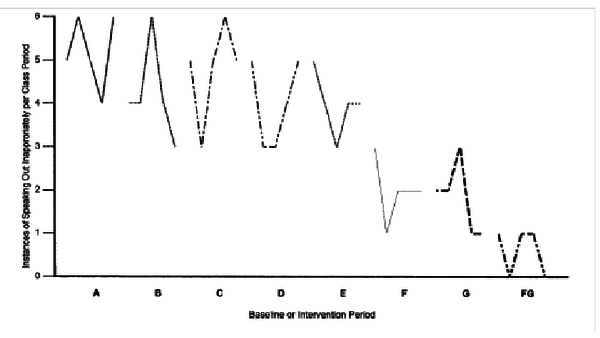 Evaluation of the data indicates several methods that (a) succeed in reducing instances of inappropriate behavior, and (b) demonstrated synergistic effects when used in combination. While not eliminated completely, instances of this inappropriate behavior were reduced from 5.2 instances per class session to less than one instance per class session.